Gregotti Associati. Lombarda Headquarters' bank. A cube measuring 55 metres on each side, two wings, a public courtyard and a truncated pyramid make up the new Banca Lombarda headquarters in Brescia, a construction with simple lines and complex form designed by Gregotti Associati and built in the "Brescia 2" urban expansion zone. The project was built on a 14 thousand square metre lot, offering an alternative to the vertically oriented tower system typically used for office buildings. The most expressive element in this geometric game is the pyramid-shaped volume containing two large meeting rooms: one with 500 seats and another with 150. These halls may be used for public events and have their own separate entrances. 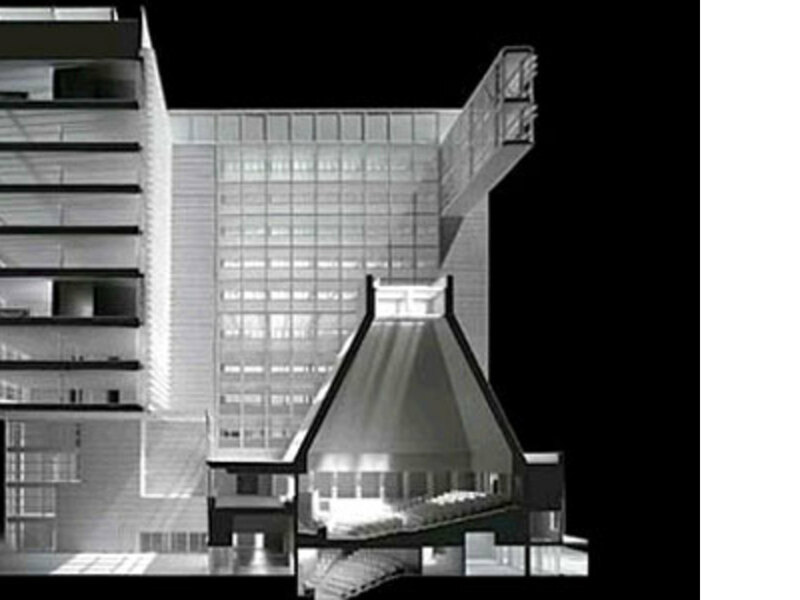 The floors containing the bank's offices are supported by three sets of large metal trusses, placed on two levels to correspond with the north stairway. The building has 12 levels with a total height of about 55 metres. Basement levels add to the amount of space available: two under the building and three outside its perimeter. The area around the building is organised like a public piazza. Four stairway towers covered with marble cladding mark the building's four corners, clearly defining its "perimeter" and plan. Reinforced concrete is the dominant material in most of the complex, with the exception of the suspended walkway, which is designed to be a bridge on multiple levels. Its 36 metre span is underlined with steel, which plays a key role in this part of the building, giving it greater transparency and lightness.